I woke with these words falling from my mouth, "The women are marching. The women are marching. The women are marching." Yesterday I worked out with Amanda, Sarah, Georgie and Libuse. I am a proud and grateful member of this Strong Women Society. We meet once a week to lift and move and strengthen our bodies. 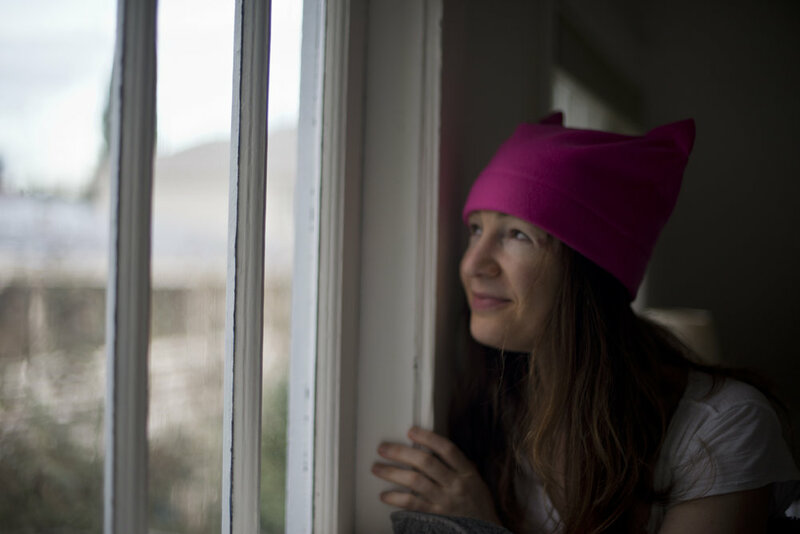 Amanda (Lucia's editorial advisor) is our ringleader, coach, and creative keeper of the space. It is sacred space to be sure, but that does not mean expletives are forbidden. They fly, along with hoots, hollers, high-fives, huge sighs, sweat, smiles, and sometimes tears. Strong women hold all of these things. Amanda has a long-time client who sews. She made a stack of pink felt hats with pussycat ears and instructed Amanda to give them to anyone who wants one. For the march. For sisterhood. For solidarity. I love mine. This morning, I woke early and gazed at it, there on my dresser in the morning light. I thought back to a darker night in November when I had curled in a fetal position on the living room floor, stunned. I thought about how my love came down to lay next to me that evening, placed his hand on my back and said, "Remember, every cloud has a silver lining. This is a terrible result, but watch for the good that will come. Something good always comes." On this January morning, tuning out the news and tuning in to my heart, I am beginning to sense the truth in his words. The silver lining is right here in the sea of women rising around the planet. The New York Times has a map that shows where all of the marches are happening tomorrow and it is a mass of red dots, not only here in the United States but all over the globe. 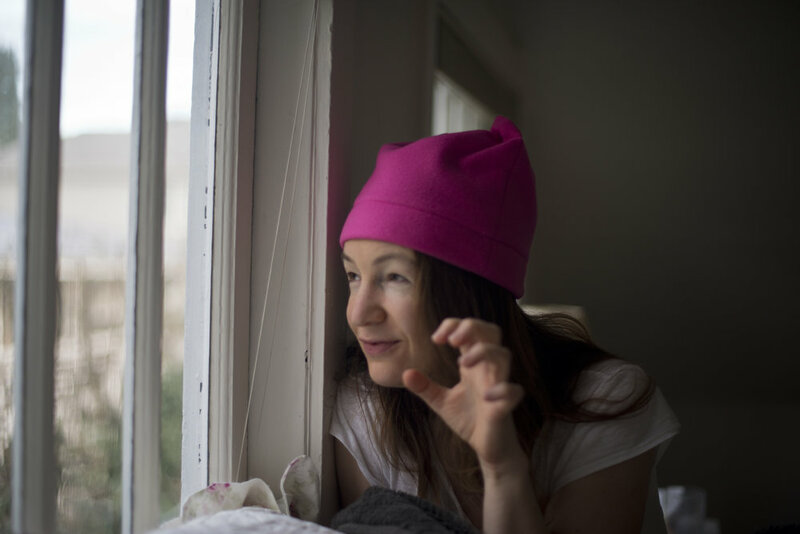 Millions of women are preparing to march, and millions more are supporting these marches in others ways they can, like sewing pink pussycat hats. The upswell is the voice of the feminine. It is soft, it is grounded, it is nurturing, and it is fierce. It has been here all along. We are collectively giving voice to that aspect of every human being, of nature itself, that has for too long been disrespected, pushed under, mislabeled, and feared. The magnitude of this "raaawr" is beyond my small ability to measure with words. It is reverberating in waves that are shaking the weak foundations of patriarchy by revealing its imbalance and speaking truth. There is good news today from Lucia's little corner of the world, too. Just this morning, I received a moving message from another strong, brilliant, heart-centered woman I know. I asked her this week if she might consider joining Lucia's team to share her talents for marketing and help us bring sponsors on board and grow. She said yes. I yelped with joy. In her message to me at dawn, she wrote, "It seems ever more appropriate and poignant on this day in our history, with tears streaming down my face upon awakening...we have some work to do." I am excited to share more about her with you very soon, once we have a chance to sit down in person next week and roll up our sleeves. Wherever you are on the planet, I encourage you to close your eyes for a moment this weekend. Take some soft, deep breaths. Place your left hand on your heart. Place your right fingertips on the earth. Feel for the connection between the two. Listen to the quiet roar. The women are marching. The women are marching. The women are marching.